This is the start. 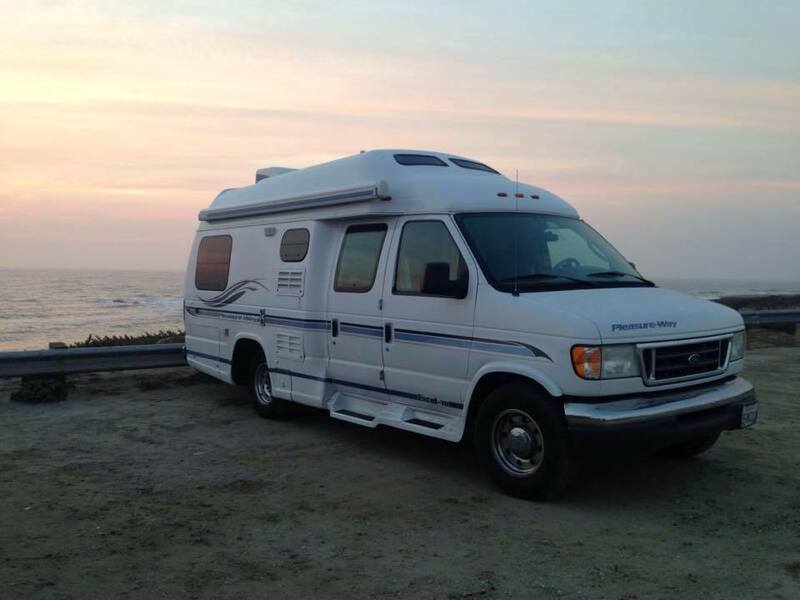 Thanks to a Second Chance, a Hefty Bonus and my Man Pulling Through, we are starting a new journey of adventure — a new life of travel via campervan, the Pleasure-Way. Having given up meats for health and consciousness long ago, a year ago we gave up dairy for heart health, along with Gluten. And added sodium. And as many GMO‘s as possible (watch this movie BOUGHT for info on what Big Pharma & Big Ag are doing behind the scenes). Yeah, that means lots of letters = DF GF LS Pescetarianism. Those letters all sum up to mean, we are kind-of-like vegetarians that avoid dairy products, like cheese and yoghurt and milk. Let me set this straight people: Cheese is NOT a meat substitute! Most often, to make it easier, I stick with the Vegan Menu eating out and tell friends “We are basically like Vegan in that we don’t eat dairy or meat, though We still enjoy fish from time to time.” — some fish that is, environmentally and ethically harvested fish and seafood, but I’m picky about that too — even the eggs we eat are pasture raised, organic and fresh. I grew up in Santa Cruz, where I think fully half the population is Vegetarian, so eating out when we travel back home is easy enough. But, when we venture past our “edible comfort zone” and are confronted with eating in a restaurant in say Reno NV or Page AZ — whew, things get a little more challenging! Like the time in Los Vegas asking a waitress if they had any herbal teas — she took the longest time to think about my question to to reply “Hum, do you mean, like chamomile?” To which I excitedly said “YES!! !” and she said “Um, no, sorry.” Black tea for She, once again. in addition to letting us “get away from it all” & “back to nature” we really liked the idea of having our own comfy bed along, being able to sleep by the sea or in the woods, and I was super stoked at the prospect of having our own food along — soy hot chocolate in the morning, salads and sandwiches we both could eat for lunch and groovy grilled salmon or veggies for dinner. You get it — a fridge, a grill, a stove and pantry stocked with foods we love, on wheels in a van we call “Rosie, the Reliable Adventurer” who’s all of 20 feet long and 9’2″ high able to fit into small spaces and get us where we need to be, just in time. Campervaning (or “Glamping” as my friends call it) is a whole new experience for this girl — so far I love it, but have trouble finding the info and recipes online to create on-the-road-meals to satisfy after a long day of driving, hiking, biking and adventuring. I expect the best things in life aren’t free — you have to work at it, learn as you go, try new things, think outside the box and enjoy this epic adventure! None of us is getting out of here alive, so let’s learn, love and live together. PS: Say Hey! These notes here are from my brain and my thoughts — I can see from this little toe-step into the water that words like Vegan and Vegetarian and Pescatarian don’t mix together very well for some folks by the comments I have not allowed to be posted here (’cause I’m all about the positive, people, and it’s MY blog). So, yeah, there. Don’t send me a note telling me what I am or am not, who I may confuse saying what-ever I am saying. Like they used to tell us when we were kids — if you haven’t anything nice to say, don’t say anything at all. I know they stopped teaching that in the last 20 years, but yeah, there it is! I get it, people have strong feelings about FOOD — so what? Write your own blog about it.